The day has come…. I have completed the long awaited bottle cap project. For those of you who don’t know I have been talking about making this project for months and have pestered my friends into saving tons of bottle caps for me. (Thank you to everyone who contributed) So after a lot of talk and not a lot of action I finally completed the project last night! Yeah! The supplies were pretty simple and inexpensive. Card Stock, 1” hole punch, thumb tacks, hot glue, craft glue, resin, an image (or multiple), and bottle caps! Download the font or image you want to use and scale it to fit in a 1” circle. 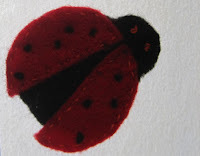 Use the 1” hole punch to make the bottle cap inserts from the image. With a dab of craft glue adhere the 1” circles to the bottom of the bottle cap. Once the drying is complete, mix your resin solution and pour into the bottle caps. (At this step you can play with the effect you want. If you overfill the bottle cap you get more of a bubble effect) WARNING: Make sure you do this is in a well ventilated area because it STINKS! 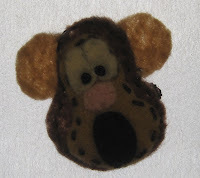 Once dry all you have to do is use a little hot glue to attach the thumb tacks and Whah lah! You’re done. 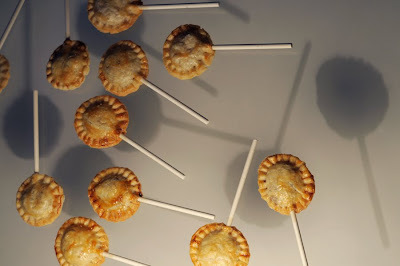 By now I would say that most people who frequent food blogs have heard about, seen, or have tried pie pops. I first saw them in July on Luxirare and have been obsessed with the idea of them ever since. The idea is genius and the product is so cute and charming. How could they possibly go wrong? I started off by making 2 homemade fillings - for the banana filling I mashed 2 ripe bananas and added a couple teaspoons of cinnamon and for the blackberry filling I minced a pint of blackberries and added a couple teaspoons of sugar. I used premade cherry and apple pie fillings, but cut the pieces up so that the filling would fit in the crust circles. I also bought pillsbury premade crust - the ones that are flat in the refrigerator aisle - so that I didn't have to make them myself. I don't know if I did something wrong, has anyone else tried these? I've read elsewhere online that they used 3" circle dough cutters, but I figure that while it may increase the amount of filling you can fit, it will also increase the amount of dough. So...you'd end up with the same issue, right? After that I had to think of something else to make for Valentine's Day to bring into work so I thought candied lemon peels would be delicious. 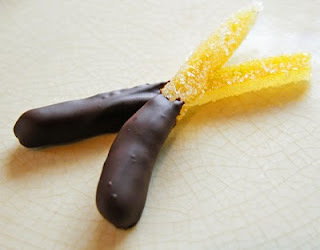 I went to Tastespotting.com and searched lemon peel and so I clicked on the first one, Tangy Lemon Peels Dipped in Dark Chocolate from Cooking Weekends and followed the instructions because I had never made these before. The instructions say to parboil the lemon peels for about one minute in order to remove some of the bitterness - that made sense to me, so I did it. Then the directions say to mix one cup of water and one cup of sugar over heat, stirring until sugar is dissolved, then add the lemon peels and allow to simmer for about an hour. Done and done. After my pie pop disappointment I had my mom taste these first and I feel a little bad about that. They were bitter...with an awful aftertaste. What the heck? I looked online and other recipes for candied peels and they said that you should boil the peels for 20 minutes and then change the water 4 times (so boiling for a total of 80 minutes) in order to remove the bitterness. Then you're supposed to simmer in the sugar water for 2 hours. Granted, this was the most extreme version, but I only had 3 oranges so I had to get it right this time (I used all the lemons the first time so I had to switch to candied orange peels). Other V-day weekend sadness included making homemade roasted tomato soup that ended up tasting pretty similar to canned Cambell's Tomato Soup and being in an accident on Saturday morning in the Michael's parking lot...I should have known that things were only going to go downhill from there. I made these little guys about 6 months ago with the intention to put them on baby onesies, but then I realized if my husband found baby clothes, he might have a heart attack. And since I am not sure if his life insurance policy is up to date, I would rather not risk it. :) So they have been sitting in my sewing box for months. I have decided to share them with you guys and with a little magic (Photoshop) I was able to put them on onesies without my husband discovering a baby-r-us receipt. Inspired by my post last week, Meg and I plus the other girls in the design department tried out the felt fortune cookies. They turned out great and they were super easy!